I don’t know what’s been up with Zack Snyder as of late, but the guy sure has been enjoying sharing all kinds of interesting trivia pertaining to Batman V Superman: Dawn of Justice and Justice League in recent memory. Sometimes, he may provide answers regarding things that have puzzled moviegoers for the past couple years, or he may declassify some cool pictures. Either way, he’s doing a fine job of keeping DC fans engaged. Unfortunately, though, it seems as though there’s at least one conversation that the auteur can’t carry on – and it looks like he has a good reason for being stymied. 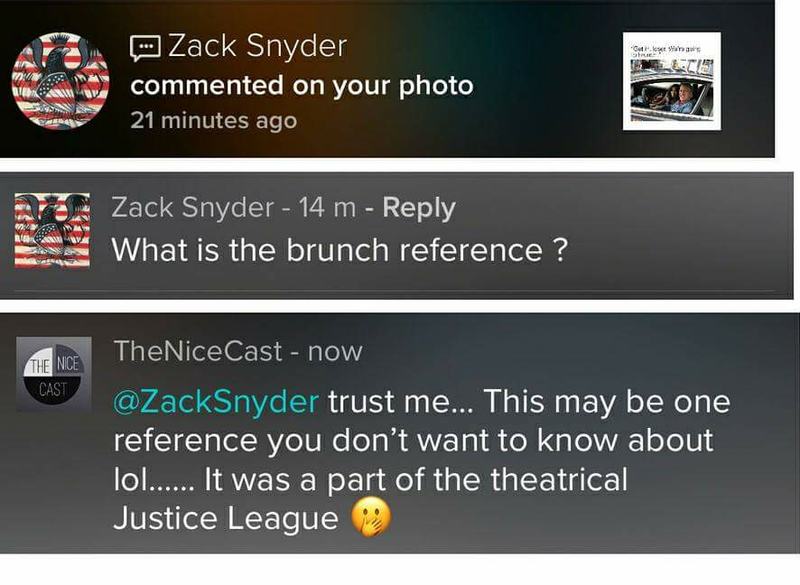 You see, in another exchange with a fan over on the social media platform Vero, someone referenced the Flash’s unfortunate rant about brunch as seen in Justice League, and, well, you’re just going to have to take a look for yourself. Of course, the story here is that it appears as though Snyder has yet to see the version of Justice League that was shown in theaters and, if we’re to look at it from his perspective, it’s easy to sympathize. Think about it: It was to be his third foray into the DC Extended Universe – and originally the first in a two-parter – before the studio took it back from him and had another director radically alter the final product. When you look at it like that, it’d be hard for anyone in this situation to sit down and watch the flick – if they ever even do. Really, I’ve seen people in a variety of media unable to take in whatever followed their initial work, even it’s something as simple as a sequel they weren’t involved in. That said, let’s allow for Snyder to take his time because it’d be quite intriguing to learn his thoughts should he ever watch the Justice League that isn’t his.